In Overdrive the front and the back of the laryngeal opening approach each other, making the opening of the larynx much more narrowed and creating an angle between the arytenoids and the aryepiglottic fold, and also an acute angle between the aryepiglottic fold and epiglottis. The cuneiforms are rolled in even more. All these features are more exaggerated than seen in Curbing but less than is seen in Edge. 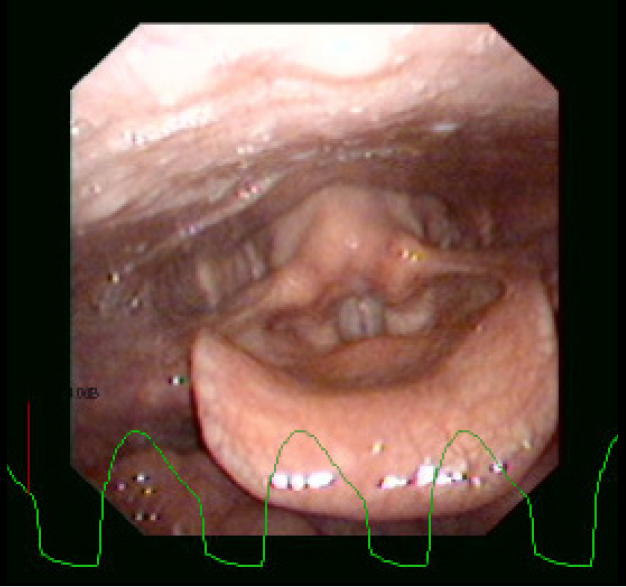 Also notice the laryngograph waveform in Overdrive shows a steep onset and a fairly long closure of the vocal folds and sometimes a roll off with a little knee. The steep onset indicates that the vocal folds are coming together very rapidly and stay together for longer, so they are more closed than open during the vibratory cycle, which corresponds nicely with the loud volume often used in Overdrive.